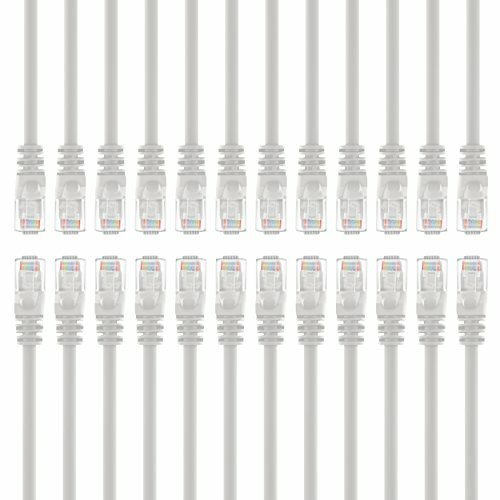 GearIT 24-Pack, Cat5e Ethernet Patch Cable 25 Feet - Snagless RJ45 Computer LAN Network Cord, White - Compatible with 24 48 Port Switch POE Rackmount 24port Gigabit by GearIT at Pacs BG. MPN: 25CAT-WHITE-24PK. Hurry! Limited time offer. Offer valid only while supplies last. industry standard ANSI/TIA-568-C.2, cat5e, ETL Verified cables with High compliance RJ45 (8P8C) snag-less connectors and molded strain relief boots. View More In Ethernet Cables - Page 3.